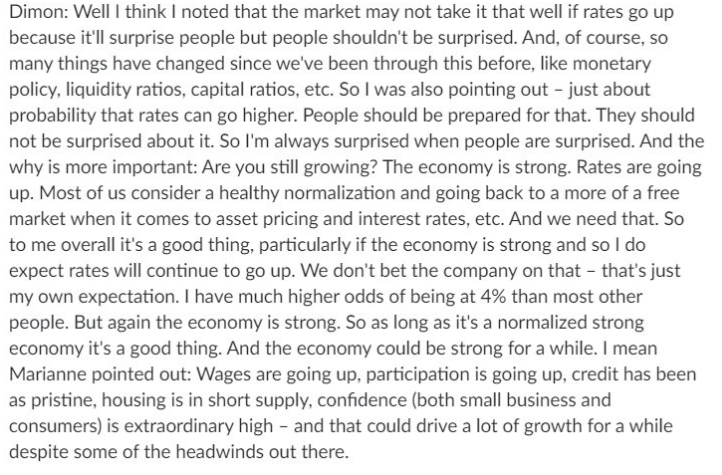 Jerome Powell is "doing an excellent job"
People should be prepared for rates to go higher "we need that"
He's upbeat and sounds like he's preparing for a continued rise in yields. Of course, higher rates will also help JPMs bottom line. Separately, Citigroup shares are leading the way in the pre-market, up nearly 3%. The company said there could be a slight increase in credit card delinquencies in the coming years but that it would still be well under control.